On Friday, September 7, Frederick Douglass’ personal copy of The Works of Robert Burns undertook a historic trip back to the town where it may have been purchased. The Department of Rare Books, Special Collections, and Preservation lent the book to the New Bedford Whaling National Historical Park in Massachusetts to be put on display with The Seraph, an 1836 hymnal also owned by Douglass. The Works of Robert Burns is historically important rather than important for its literary content. On its surface, it is an ordinary book of poems by the Scottish author Robert Burns. Published in Philadelphia in 1841, the book was reprinted many times throughout the first half of the 19th century. Frederick Douglass greatly admired Robert Burns, quoting him in letters and speeches throughout his life. When Douglass travelled in Scotland during his trip to the United Kingdom and Ireland in 1845-1847, his visited Burns’ birthplace home in Ayr and met with the poet’s young sister and nieces. Writing home to a friend, Douglass enthused about Burns and quoted from his poems extensively. In an 1892 interview, Douglass noted that Burns is still one of his favorite authors. There is no definitive proof of when and where the book was purchased by Douglass, but his inscription gives us some clues. After Douglass and Anna Murray were married in New York City in September, 1838, the couple moved to New Bedford, where he found work in the town’s shipyards. The Douglass’ lived in New Bedford until 1841, the year The Works of Robert Burns was published. An 1838 New Bedford city directory lists 3 booksellers, and it is entirely possibly Douglass purchased the book in town in 1841 before he moved with his family to Lynn, Massachusetts later that year. 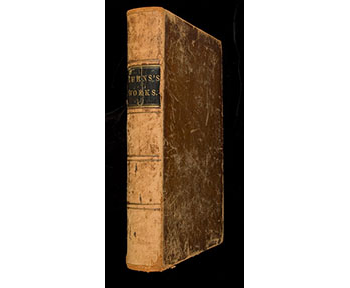 The inscription also tells us that Douglass gifted this book to his eldest son, Lewis Henry Douglass. We cannot know the exact circumstances of the gift, but it was made 6 days after his 27th birthday and not long after he moved to Denver with his brother to pursue a career in printing after being shut out of printer’s unions in Washington, D.C. because of his race. Lewis Douglass enlisted in the 54th MA Infantry in March 1863 and was badly wounded at the Second Battle of Fort Wagner in July 1863. He married in 1869 but was unable to have children due to injuries sustained in the war. How do you transport a book like this 400+ miles across state lines? Very carefully. Before the book left the library, a condition report was run to ensure a record was kept of the current state of the book. It was then carefully packed in a protective case. I drove the book to New Bedford and helped unpack it and set it up in its new, temporary display case. Exhibits manager Travis Johansen built a custom cradle for the book which keeps it supported and safe. The Seraph, on loan from the Frederick Douglass National Historic Site in Washington, D.C., is in the same case. It too has an inscription in Douglass’ hand: “This book was brought with me when I made my escape from slavery in 1838, and is kept in memory of that event.”3 The two books are presumably together for the first time since Douglass gifted The Works of Robert Burns to his son in 1867, over 150 years ago. They will remain together until the end of October, when each returns to its respective home. 1. Robert Burns, The works of Robert Burns : with an account of his life, and criticism on his writings : to which are prefixed, some observations on the character and condition of the Scottish peasantry / by James Currie, M.D. ; including additional poems, extracted from the late edition edited by Allan Cunningham (Philadelphia: J. Crissy, 1841), unnumbered page at front of book. 2. Frederick Douglass, Life and times of Frederick Douglass, written by himself (Hartford, Conn: Park Pub. Co., 1882), 256. 3. R. Shaw, The Seraph, Or Baltimore Collection of Church Music; Containing Psalm & Hymn Tunes, Anthems, Sentences, Etc. Including a Number of Extracts from the Works of Handel, Haydn, Mozart, and Beethoven; & Adapted to the Use of All Denominations: together With a Manual of Instruction, Arranged on the Pestalozzi System (Baltimore: J. Cole, 1836), unnumbered page at front of book.